Vegan lemon bars are tart and sweet and use whole ingredients, plus no tofu and no cashews! Easy and with a vegan shortbread crust. I’ll start by confessing. I might have eaten four squares of these vegan lemon bars in one day and I might have contemplated eating four more squares, that’s how good these are. I knew the crust would have a shortbread feel, but I started to get a little stuck on the filling. Normally, eggs would be used to thicken the filling and provide a base, but for these I needed something else. After doing a little research, a lot of vegan lemon bar recipes called for silken tofu in the filling or cashews. While normally, I would be all for these two substitutes, I didn’t have tofu on hand and my cashew supply is running a little low (because I was making this and just inhaling it like nobody’s business). So, I set out to create a vegan lemon bar recipe without tofu. For some reason, banana kept sticking in my brain as a vegan egg substitute and I just couldn’t get it out. I kept trying to rationalize it away, thinking that the banana flavor would shine through the lemon too much or it wouldn’t get that lemon bar gel set up right. Then, I realized that my baking gut was telling me that I should just try it, so why not? If things went wrong, I could just try something else if it was a big flop, right? I know it sounds strange, but I feel like after several years of baking and tweaking recipes, my baking gut kicks in and can tell me how long to keep a cake in the oven or how much flour is really needed in a batch of cookie dough. So, I trusted my gut with these vegan lemon bars, and my gut didn’t lead me wrong! I upped the amount of lemon juice and zest in the recipe and used a ripe banana to partially sweeten the filling. Adding in cornstarch and a bit more sugar allowed the filling to set up and get that classic lemon bar texture you know and love. So, here I give you a tofu-less, cashew-less vegan lemon bar recipe, with a healthy dusting of powdered sugar, of course. For this recipe, I loved using this simple 8×8 pan that easily made the perfect amount of vegan lemon bars! Do these taste like banana? Yes and no. There is a slight banana flavor, but if you add enough lemon juice, they for SURE taste like lemon more than banana. Yes! Double the crust and the filling to make sure you have enough. Use a 9×13 pan and make sure it’s lined with parchment paper! Do these use cashews or tofu in the filling? No! I wanted to avoid using ingredients that everyone might not have on hand. Bananas are the perfect substitute and make these slightly healthier without adding fat. In a small bowl, stir together the flour, coconut oil, and powdered sugar until the dough comes together. Press into the bottom of the greased pan and bake for 7-9 minutes, until the edges are golden brown. You don’t want to over bake the crust, or it will become too hard after you add the filling. Set aside. In a medium bowl with a handheld mixer, beat together the banana, lemon juice and zest, sugar, vanilla extract, cornstarch and flour until fairly smooth and combined. Bake for 30 minutes, until filling it set. Allow to cool and refrigerate for at least 1 hour, until cool. This site uses affiliate links. I only link to things I know and love, I hope you love them as much as I do! I have been wanting to make lemon bars for weeks now and I think you just convinced me. That intro where you say you ate four? I got so jealous my stomach growled a little bit. They’re absolutely gorgeous, Abby! Haha, I’m not proud of that, but I’m still happy with my decision! Thank you Sarah! Your “baking gut” deserves an award. These are genius! I love lemon bars. These look so yummy and I love that they are vegan! They are my favorite now! I was JUST thinking about trying out a vegan version of lemon bars but didn’t even know where to start. Wonderful adaptation! So since I’m not a big fan of bananas (ick! ), I assume I can make this without them. Can’t wait to try these! I’m not sure how they would turn out without the banana, but it’s worth a try! I’m not a fan of bananas either, but it’s not really noticeable in these (I don’t eat bananas and can’t tolerate them in smoothies. But, I’m ok with banana nut bread, if that’s helpful). I’d say give these bars a try with the banana first- you might be pleasantly surprised. Well I’ll be! Banana is such a genius idea! I always have bananas laying around, so I could easily make this in a jif! 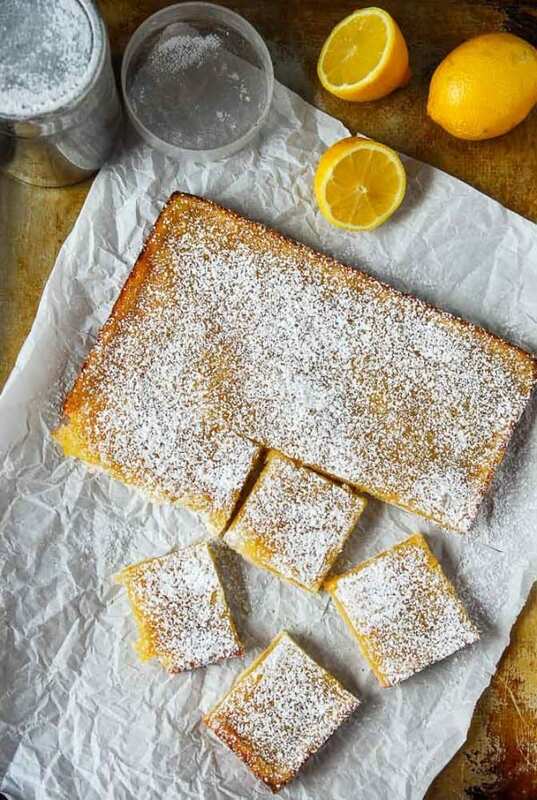 These lemon bars look absolutely perfect and zesty and I want the whole lot of them! I love a good lemon bar – very interesting with the banana – cannot wait to try these! These lemon bars look great! It looks like they held together well. What a great solution with the added banana. I know all about the “baking gut”. It’s the one that tells you the food is done when you are far away from the oven and you go running….hahaha! I feel the same way! It’s hard to justify using ingredients you might only use once or twice! They are so nice and easy! I was doubtful, but it’s so good!! I love lemon bars but I have to make them egg-free due to food allergies. What a great idea to use bananas instead! Thanks! These look so good! I’m sure I’d eat half the pan! I have lemons that need to be put to good use…I think I’ve found what I can do! yes yes yes! You will love them, I promise! Lemon bars are my absolute favorite! LOVE that you made a vegan version of this! Pinned! Love vegan lemon bars! I’ve never tried using coconut oil for the crust. I definitely need to give that a try. It makes it so nice and buttery! I mean butter is butter, but still! My baking gut is a little different from yours. That is, my gut is big because of all the baking I do. Ha ha ha! I would totally eat half the pan of these too (hence baking gut). I’ve used agar agar, irish moss, and cornstarch as a thickener in vegan lemon bars but I am loooooooving the idea of banana! Ohh those are all good ones! Hi Bianka! I know this is late,but I hope these turned out well for you, let me know! Yes, it turned out very good in the end! I made it again the next day for my grandma’s birthday 🙂 I used brown sugar in the first version, and the color wasn’t really pretty, so I used agave syrup for the second one, therefore I added more cornstarch, because the syrup is also liquidy… I cut ot hearts, it was lovely 🙂 I will definitely make it again! Ahh that sounds lovely! I’m so glad you loved it! these look amazing and super easy!! Just one question, does the banana flavor really stand out? Reading through the other comments, I’m apparently the only one who could taste the banana and that’s almost all I could taste even though I used three huge lemons. I actually threw them away. The crust, however, was delicious. I’d use the crust again with a different recipe for the filling. I was on the hunt for some vegan desserts when I came across your website a few days ago. I made these lemon bars earlier today and they are fantastic! The banana is a great addition that compliments the tart lemon perfectly. Will definitely be making these again 🙂 Thanks! Ah hooray! So happy to hear you loved them Morgan! Unfortunately, these really did not turn out for me! The crust looked amazing when i took them out after the initial 7 minutes, so I was super excited, but the end product was a huge fail. After chilling them for an hour, the crust was glued to the pan! I couldn’t even cut these, and couldn’t get them out of the pan, even though I had greased it super well with coconut oil…. Not sure where I went wrong. I followed the recipe to the letter. 🙁 I was able to try the lemon topping, and it was OK. Tasted super lemony. My boyfriend stated it tasted like a lemon cough drop… I used 3 large lemons, maybe that was too much? Any pointers if I were to give it another try, with parchmin paper? Oh no, I’m so sorry Stephanie! I’m not sure if it’s different in oven times or the type of pan, but using parchment paper could do the trick! Maybe try to underbake them next time to prevent the crust from sticking too much? I would also say grease the pan a little more than usual, just to be sure. Please let me know if you have any other questions! These were so good! I tried one when they were a bit warm still, and while delicious the banana flavor was a bit strong. Once they had cooled completely though, all you could taste was lemony goodness in the topping. I loved the use of coconut oil in the crust. I used unrefined, so there is a lovely coconut undertone to these. Ahh hooray!! I’m so so happy you liked them! Any suggestions for a gluten free alternative for the flour? Do you know the nutritional facts for these? Hi Taylor! I do not, but I know there are a lot of tools out there to calculate the facts for a lot of dishes. Do you think I could use arrowroot instead of the corn starch? Hi Daisy! I haven’t made them with tapioca starch myself, but I would say go ahead and give it a try, let me know how they work out! Hooray! I’m so happy they turned out for you! I made these with my brother and replaced the banana for 2/3 cup applesauce and it turned out ok. I should have either put less in or added more cornstarch. They turned out way too sour for our liking, that was my mistake as I didn’t taste it before putting it in the oven. Hello! This is a genius of a recipe! I love that it uses bananas instead of nuts to make the lemon bars creamy! Can’t wait to try it! Hi! I Just made your vegan lemon bars. They are delicious! I doubled the recipe, and used my own crust from oats, almond butter, dates, and almond milk. The flavor of the filling is so tasty. I can taste a hint of banana, but it compliments the lemon so well. I’m waiting for it to cool so I can put it in the refrigerator and top it with powdered sugar. I’m sure it will taste that much better! I’ve already ate a section of it. .
Just thought I would let you know that these bars are terrific. I have vegan friends who love this recipe and they were thrilled that I would go to the effort to find a dessert they could enjoy. My non-vegan friends don’t even know these are vegan. They certainly are a new standard recipe in my household from now on. By the way, I am neither vegan or vegetarian. And as for the banana? What banana, no one could taste it. Thank you, all the best! This makes me SO happy! I’m so glad everyone loved them! What if I substitute the coconut oil with butter? What is the measurement of one cup in grams? Please. Thank you. Since becoming vegan a little over a year ago, I wasn’t sure if I’d ever be able to enjoy desserts the way I had in my omnivorous past. I adore baking and a multitude of desserts with lemon bars being number one. When searching for vegan lemon bar recipes, yours popped up and I figured it would be worthwhile to make them. The first time I made them, I loved them! (I ate half of the tray myself before sharing them with the rest of my family). There’s just something about that tart lemon taste melding with a coconut crust that is so soothing. Since then, I’ve made them three more times. And, I must say, I LOVE them more than non-vegan version I was accustomed to baking. So, kudos to you for making an awesome recipe! This makes me so happy! Enjoy! Frosted Vegan your lemon bars were simply scrumptious! The filling held up perfectly and the crust tasted so so so good with the coconut oil! Banana flavor – zilch. Just a rich delicious treat! Thank you! YAY! That makes me so happy! They have become a fast favorite here, so I’m glad you loved them! Cannot wait to try these … also a whole lot lighter on the pocket using a banana over tofu or cashews, especially here in Europe. Thanks for this! Could I sub brown sugar for granulated sugar? Hi Patrice! You could but it would result in a darker baked good, just so you know! It should be a little bit spotty, not too brown! I’m about to do a batch of sweet stuff for the freezer – are these okay to freeze? Hi Tracey, I’m not sure if they freeze well, I haven’t tried it! Please let me know if you do and how it works! Has anyone tried using earth balance (a vegan butter alternative) instead of coconut oil? Hi Rachel, I don’t know for sure if anyone has, but it should work the same with Earth Balance! I love lemons! I made these and mine also welded to the pan after chilling. I had to toss ’em. I also think my banana was too ripe, because the banana really shined through. Yours look a lot a lot a lot more yellow than mine. Mine were like an unappetizing cream. I hafta try again. This vegan hearts lemon bars! Oh no, I’m sorry to hear that! I would say definitely grease and line the pan with parchment paper! If you want to decrease the banana next time, that might also help! I want to get the amount of lemon juice just right. Would you say 1/2 to 3/4 cup is reasonable? And should I just taste the filling to tweak the amount? Thanks! Making these for a family picnic and MUST remember to pack the confectioners sugar! Yes, I would say that amount is right! Taste as you go, sometimes the ripeness of the banana can affect the taste. Enjoy! So yummy. I recently found Italian garden lemon juice, used that along with the zest of 2 large lemons; also added a tiny bit of ginger just because. Came out very nicely. Not as yellow as I expected, but flavor really is more important than appearance, in my opinion. Thank you for the recipe. Glad you enjoyed them! I like the sound of your additions, I’ll have to try that next time! Hi Abby! I am using silken tofu instead of a ripe banana. May I know the gram of the ripe banana used so as to do a 1 to 1 substitution, please? Hi Ava! I’m not for sure on the grams, but an average banana is 101 grams, so I hope that helps! Could it be that using coconut oil to grease the pan is what make them stick? Try a cooking oil that doesn’t go solid when it chills for greasing. That could be possible! I’ve found that a spray might be best! My daughter is gluten, egg and dairy free so finding desserts that we all enjoy has been tricky, especially to the discerning palate. We made this recipe with Pamela’s All-Purpose Gluten Free Artisan Blend( Non-Dairy). I made sure to bake the crust as instructed but forgot to place the timer on for the lemon filling. I baked until I was able to insert a knife and it came out “clean”. They were delicious! Even my dad who’s not a fan of gluten- free anything loved them. Living in Arizona, our orange tree is bursting! I’m adapting the recipe with orange juice/zest for a party tomorrow. an’t wait to see how they come out! So there’s no top crust? Note – some people told me that it was just a bit bitter (they’re not true lemon fans), so a little less zest might be the way to go if one is making this for a big group. Just from my experience though–When I made the filling using four lemons (zest and juice) rather than three, I needed to add another half a banana or the mixture was too thin. Hi, I realize this recipe was posted a long time ago. When I made this recipe the lemon topping didn’t set, I’m wondering if it’s because the lemons I used were very large and it equated to too much lemon juice. Did you use small or regular sized lemons? I used organic ones that were quite big. Thank you so much! That would be amazing. I admire your creativity with baking. Hello! I attempted to make the lemon bars and did not get very far. I am allergic to gluten so I swapped the flour for a cup of white rice flour(Bobs red Mill) /tapioca flour (Organic maybe) and cornstarch ( regular) mixture and it was awful!!! I did make the filling though, but have no crust to put it on. I also had a really hard time mashing the banana to not be so chunky. That normal? I used organic powder sugar and the coconut oil I melted out 2/3 was that correct? Since I haven’t tested the recipe using GF flours, so I can’t ever guarantee that the crust would turn out using different flours. Since the structure of GF flours and AP flour are very different, they will bake differently. As far as the filling goes, I usually use a fork or pastry cutter to get it really blended, but if you want, you can blend it in a blender to get it super smooth too. How much lemon juice is 3-4 lemons? I have juiced lemons that I froze and would like to use that juice but not clear on how much that should be. thx. would each frozen cube be a lemon? I would love to make these but don’t know how many mls/grams of lemon juice I might need?? Please help. Hi Diana, I would say 1/2 cup of lemon juice would be perfect! I am allergic to bananas – any suggestions? Hi Brenda, I haven’t used anything besides for bananas, so I don’t think there is a great replacement. So sorry! what are the nutrition facts for these? Hi Jasamine, I haven’t added nutrition facts yet, but stay tuned and I am going to be adding them in soon! I did a gluten-free version using Bob’s Redmill all purpose blend. I am sensitive to overly sweet things, so I did a scant 1/2 cup powdered sugar for the crust. I sprayed a pyrex dish and also used parchment paper. I baked the crust for 7 minutes. Juuust long enough to show the slightest hint of ‘baked’. My banana was bizarrely huge and very old. It was frozen. I thawed it before hand. I really don’t like the taste of banana so I put in the rind of 4 lemons and a scant 1/2 c of lemon juice, which was 2.5 lemons for me. I also did a scant 3/4 c of granulated sugar. Next time I’d do a little less still. They were wonderful, but I still prefer less sweet. Used a submersion blender to mix ‘er all up. I baked mine for a little longer than 30 minutes. Probably more like 34. I let them cool for about 1/2 hour on the counter then another 1/2 hour in the fridge. Couldn’t taste even a hint of the banana. The crust didn’t hold together perfectly, but that might also be because when i was trying to press it into the pan, the parchment paper was sliding around a bit. We also didn’t wait for the full hour for them to be chilled. Even if neither of those were the cause, I didn’t care and neither did anyone else! It was so minor. The lemon was fully set without issue. So great, and thanks for this! I was missing my grandmother’s lemon squares from when I was a kid this holiday season. It’s been a loooong time since I’ve had them so it’s tough to actually compare, but these sure taste like them. And cruelty free! Woot! This is amazing! I love all your tips and am so happy your liked them! I made these today and on my goodness gracious they are delicious! Since going plant based I crave sweets like a beast and these definitely satisfied my sweet tooth. Thank you for sharing this recipe. Will be recommending these to friends. I did use the whole wheat flour and I used brown sugar instead. I’m happy to hear that! I always crave lemon bars, so I’m glad this recipe helps you fill that craving too! I’ve made this recipe twice. The second time, I did the recipe plus half in the same size pan and it made the texture creamier and less chewy/leathery since there was more of it and the top didn’t dry out while cooking. I highly recommend making it that way….great recipe! If you don’t like bananas you can’t even tell there are bananas in there when its all cooked. The lemon covers it completely and you cant tell by the texture either. Super delicious! This is great advice! So glad you liked it! I was skeptical about this recipe: the crust didn’t look like much and the filing was very runny. However, they were awesome! The crust was very good and the filing was perfectly sweet and tart and firmed up nicely. I did use parchment paper and I added a lightly lemon extract to the filing too, just because I had it. They were a hit with all the mamas on Mother’s Day 🙂 Thank you! I’m so happy to hear that! Happy Mother’s Day! I made these for my husband’s birthday. Super good! They did stick like crazy to the oiled parchment paper, but they were worth the struggle. I made almost exactly as written but used only 2 lemons to get the 1/2 cup juice. They were very tart, which we LOVED. No one tasted banana in it and I used Cup-4-Cup gluten free flour (it’s rice based and I read a comment where that might be why it stuck so badly.) We served with a small scoop of vanilla coconut ice cream which matched perfectly with the tartness. Thank you! That sounds AMAZING! It’s good to know that it works with the GF flour blend, but I would agree that that may be why they stuck. So happy to hear that you made these to celebrate your husband’s birthday! Hooray! That makes me SO happy to hear! Can self rising flour be used in the crust? Oh no, sorry to hear about the crust! Sometimes it can be a bit liquidy, but should set up in the oven!